JD Skill Drill | Blog | Ms. JD | Determined to Rise. This reality weighs even heavier on the JD hired in a non-practicing capacity, where you will be expected to foster relationships with the business to troubleshoot issues and develop solutions on a daily basis. At the very top of almost every single job description was a stated desire for “strong written and verbal communication skills”. Don’t think for a second that this means engaging in IRAC-style emails to your business constituents. Today’s employers value brevity – there simply isn’t any time (or attention span) for long-winded advice citing rules, cases and accounting for every conceivable issue under the sun (as we would on law school exams, for example). Interestingly, even government agencies have come out with a call for better communication in the form of plain English writing. In 1998, the U.S. Securities and Exchange Commission published A Plain English Handbook with a foreword by Warren Buffett calling on readers to write as if they were addressing his sisters, “Dear Doris and Bertie.” This document is a true classic that stands the test of time. It should be required reading for law students. Lawyers are analytical by nature and should be trained to be effective communicators outside of the courtroom (where 98% of lawyers spend their time). Sadly, all too many are still using legalese as a crutch in their communications and may end up alienating their business counterparts. Do yourself a favor and edit out all the "wheretofores" from your writing. Any JD Preferred role will require some form of project management, whether you’re managing people, problems, projects or processes. As you gain seniority, all of these things will become your responsibility to handle. Alas, most JDs are taught how to serve as “trusted advisors” but are not taught how to manage. It will be up to you, whether through experience or additional training (proactively pursued if you’re smart; imposed on you if you’re failing), to gain these skills if you want to demonstrate value to your employer. 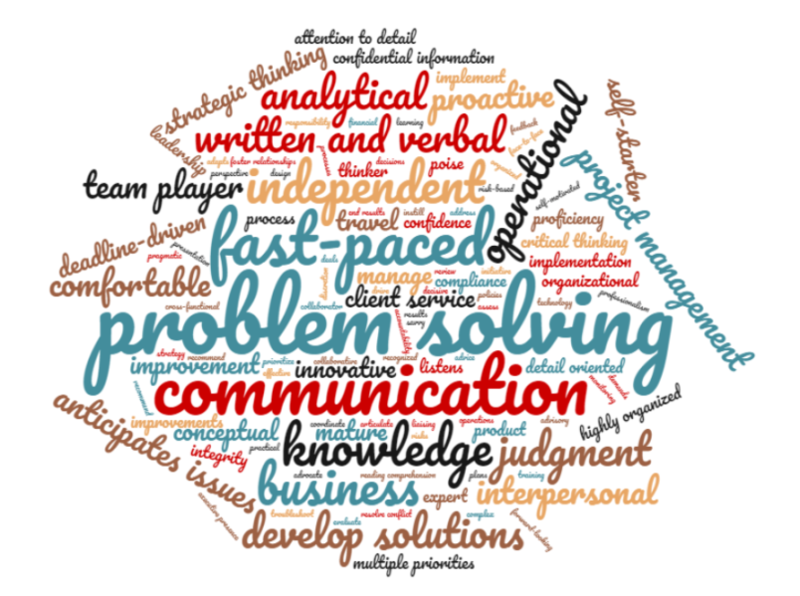 To sum up this exercise into one sentence for the TL;DR crowd: Today’s employers are looking for independent problem solvers who can proactively anticipate issues and develop solutions with the business in a fast-paced environment using their written and verbal communication skills. Take a deeper look into the word cloud to assess where you stack up. What are your strengths? Make sure your resume highlights them. What are your weaknesses? Make sure you spend some time working on those to make yourself a more competitive candidate.